The practical things in your kitchen are rarely works of art. Mixing spoons? They're rarely more than "meh". Measuring cups? Absolutely not. But this beautiful chopping board from The Big Chop will soon have pride of place on your bench - and become an indispensable part of your meal preparations too. Tasmanian craftsmen construct each unique board from hand selected timbers, ensuring this small but sustainable supply of native timber is available for generations to come. Durable and heavy enough to stay put no matter how tough the chopping job, it will last through a lifetime of chopping and slicing. And because of its lovely variations in timber colour and grain, a Big Chop chopping board can also be used as a serving board. Wheels of cheese and antipasti platters will look amazing on it! When it's the small details in your home that matter, a Big Chop chopping board will bring some rustic beauty to your kitchen every day. Handmade in Australia from Sassafras, Celery Top, Blackwood and Myrtle. Timber sourced from sustainable native and plantation forests. 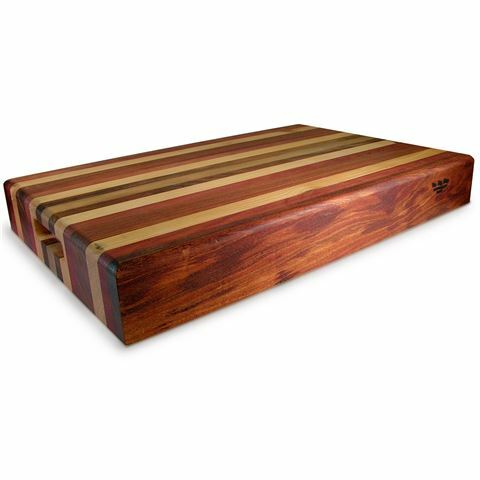 Real timber chopping boards have natural anti-bacterial properties. Dimensions: 50 x 34 x 7cm.